Flexwings have an MTOW (Maximum take off weight) that Pilots need to consider and perform an Aircraft Weight calculation. Quiks for example have an MTOW of 409KG. A GT-450 has a higher MTOW of 450KG (The clue is in the name 🙂 ). The Pilot must make sure that the combined weight of the trike, the Pilot, the fuel, any baggage and any passengers never exceed this restriction. 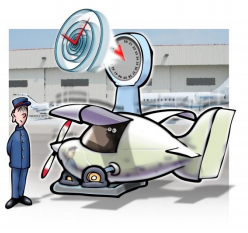 If the combined weight exceeds this limit, it not only will affect the handling, performance and safety of the aircraft, but in the event of an accident, the Air Accident Investigation Branch (AAIB) will establish the facts, do the calculation and if you’re deemed to have been over, then prepare for a ton of fallout, including the insurance could refuse to pay out. To work out the weights, the pilot would take the “Empty weight” as a starting point. Until 2015, flexwings needed weighing every 5 years. The manufacturers always have an empty weight from new as a guide, but of course there are mods that affect this (strobes/Landing lights / bigger fuel tanks etc) so when they are weighed it gives the pilot a more accurate measure. To this figure, the pilot must take the empty weight, add on his own weight, the weight of any passenger and any baggage carried. When this figure is deducted from the MTOW, that leaves the figure that can allocated to fuel. As a guide, a litre of fuel weighs approximately 0.8Kg. Over weight – Unsafe to Fly. Resolution: chuck the passenger out 😉 or remove more than 42L of fuel.